Welcome to (a long overdue) part three about unit roles and list building for Infinity. If you haven't already then you may wish to check out parts one and two before reading on. This final article in the series is going to be about putting together a capable list to take to an ITS event. It will include some general rules of thumb, strategies to look out for and common mistakes to avoid. All examples are assuming a 300 point army built for ITS missions and with no Spec Ops. All image in this article are property of Corvus Belli. You know what it's time for? 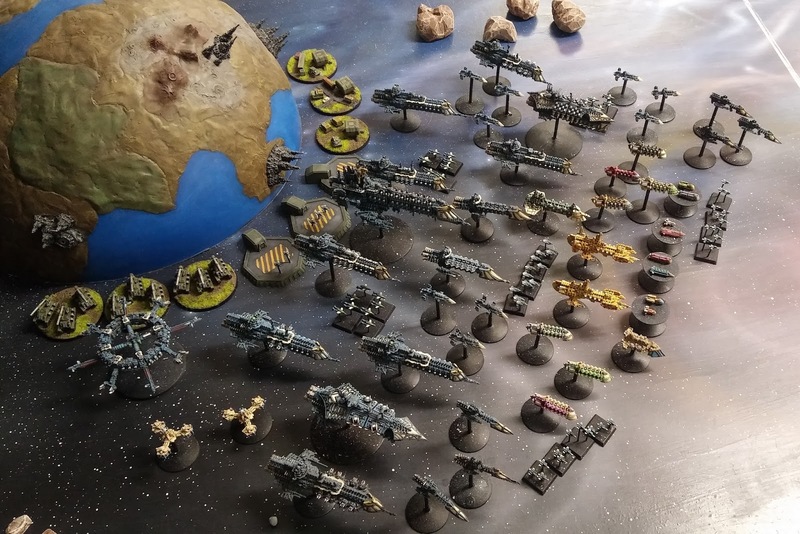 Full fleet shots! I went to a mixed 40k/BFG event last weekend and got a couple of really fun games in on a very pretty table. Of particular note was the custom built planet which was designed to look like Armageddon, although in this case it represented Ichar IV, and was the main focus of the games. Battlefleet Valkyrie in all its glory.